Celina, Ohio....There is a tremendous need for training in pet first aid and care because unfortunately, thousands of pets die every year from preventable accidents! According to the Lakewood, Colorado-based American Animal Hospital Association, 1 out of 4 pets could be saved if just one pet first aid technique is used before transporting the animal to the veterinarian. 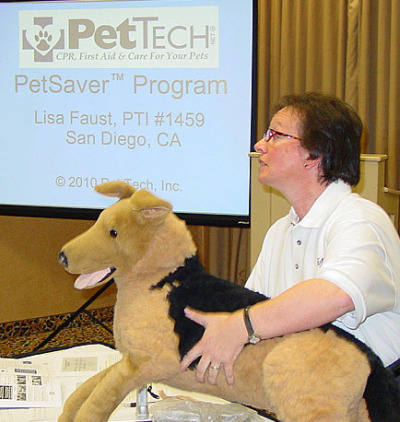 Pet Tech’s eight-hour PetSaver™ course will teach attendees to be effective; leading with your head, using your hands with awareness, acting appropriately. “Pet parents would do anything to help their furry friends, if they only knew how,” claims Lisa Faust with A New Way to Life. Faust is offering Pet Tech classes for pet parents and pet professionals. She is an instructor who has successfully completed the Pet Tech training program and is qualified to teach their family of programs. "Doggie" or "Kitty" breath is not normal and is usually a sign of poor oral hygiene that should be addressed promptly. The PetSaver™ program teaches pet parents the many aspects of caring for their pet's teeth. Pet parents will learn how to properly brush their pet's teeth, choose safe toys and healthy food snacks and work with their veterinarian to assure good dental health. On the average, pets (dogs and cats) seven years and older are considered senior "pet-izens" and are at risk for age-related health problems. In Pet Tech's PetSaver™ class, pet parents will learn the risk factors associated with older pets, proper exercise plans, diet and nutritional choices, and the things they should be doing for senior pet-izens and the things they should not be doing for pets in their golden years, notes Faust. Check out the next class location and date. For more information or to sign-up call Lisa Faust with A New Way to Life at 303 274 4930.